Home » The Denver Airport Conspiracy, What Lurks Underneath America’s Biggest and Most Bizarre Airport? 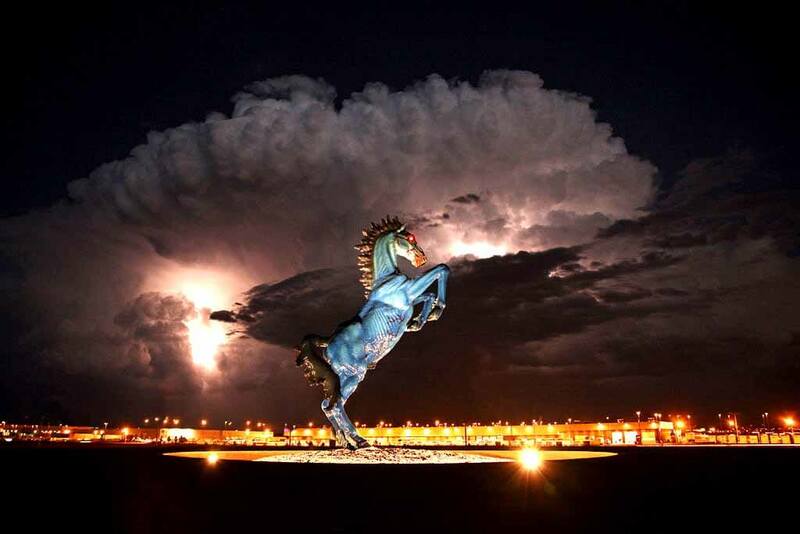 Located 25 miles from Denver on a plot of land encompassing 53 square miles, sits the second largest- and the most bizarre airport in the world, the Denver Airport. For years this airport has been fertile ground for some pretty wild conspiracy theories that involve the Masons, alien lizard people, the end of the world, an underground bunker twice the size of Manhattan – and the rise of a New World Order. Now as mental as this all may sound, this conspiracy is actually scarily believable. Now, this is where it gets freaky, and I mean like Michael Jackson’s painting collection freaky… A long, long trail of mothers holding dead babies in their arms, many more lying dead on the ground, as a gas-mask wearing, evil warlord holds a huge sword and a machine gun, thrusting the sword into the belly of the white dove of peace. Notice that the evil warlord doing the killing is a military soldier, where the gas-mask refers to the use of some kind of biological weapon. What would be the message here other than a warning of a coming holocaust of unimaginable proportion. In any event, why are these images used if not to send a message of some kind? The mural clearly is telling the viewer a story of some kind, and it is absolutely one of deeply disturbed horror. What lies below the airfield? The airport was built in 1995 on 34,000 acres (53 square miles) in spite of the fact that Denver already had a fully functioning airport. In fact the new airport has less gates and less runways than Stapleton did and no technological advancements to justify its construction. All it does have is a lot more acreage. More acreage than an airport that size could possibly need. The initial cost of this new airport was to be 1.7 billion dollars but by the time they were done, it cost about $4.8 billion which is obviously extremely over budget. The contracting team must have been similair in size to the team who build the Death Star and was privately funded. What is extra bizarre, is that nobody knows by whom and why it was so extremely overbudget. Some believe that the large amount of unoccupied space that the airport is built upon and the extra money spend is linked to what lies beneath… namely, a huge underground military bunker, which would reportedly be used to house people of importance and as a civilian detainment camp. Sounds crazy doesn’t it? Well, then wait till you read some of the facts below. The roof of DIA is made of 15 acres of Teflon-coated, woven fiber glass, which makes it impossible to see inside the place with radar. Even though the area is basically flat, the expense and time was taken to extensively lower some areas and raise others. They moved 110 million cubic yards of earth around. This is about a 3rd of the amount of earth they moved when they dug out the Panama Canal. The entire roof of DIA is made of 15 acres of Teflon-coated, woven fiber glass. The place looks like a bizarre scene out of “Dune”, composed of huge, spiked tent-like structures. The material reflects 90% of the sunlight and doesn’t conduct heat. So you can’t see into the place with radar or see heat signatures. The Denver Airport Conspiracy is just something so big, that it’s hard to wrap your brain around it and take it seriously. If there is a secret organisation of filthy rich, lizard people plotting to rule the world then why would they ridicule themselves by leaving such obvious clues in one of the busiest places on earth? It pretty much defeats the purpose of being secret. However, anyone who has ever visited the airport knows it’s a few fries short of a happy meal and if there is such a thing as a giant super secret bunker then the Denver Airport would be where Dr. Evil would build it. Also, if you ever visited Denver airport yourself and noticed something was off then please share your experience by dropping a comment below.